Back row, from left: Shig Yokote, George Hamai, Asa Hanamoto, Norman Kamada, Frank Kageta, Leo Hosoda, James Iso. Front row, from left: Mack Tsujimoto, Tom Takahashi, George Kakiuchi, Masao Hamamoto, Goichi Hamamoto, George Goto, Frank Fujita. Almost 500 people gathered on Saturday morning, Nov. 10, in the Del Oro High School Auditorium in Loomis, Calif., for the Placer County Congressional Gold Medal Ceremony. Over the last year, there have been many gold medal ceremonies held in many communities all over the United States, most recently in Marysville, Yuba County, the next county over from Placer. This ceremony had several aspects that differentiated it from the other ceremonies. First and foremost, the ceremony included the awarding of 14 posthumous Bronze Stars. The Bronze Star is a military award, as opposed to the Congressional Gold Medal, which is a civilian medal, so military protocol had to be followed. Each recipient’s family needed to provide proof of military service, verified by the Army. The Bronze Star is the fourth-highest combat award of the U.S. Armed Forces, and is awarded for acts of bravery, acts of merit, or meritorious service. It can only be presented by a general or someone of equivalent rank. Fortunately, planning committee chairman Gary Hongo, a retired lieutenant colonel in the U.S. Air Force, was able to make arrangements for Vice Adm. Robert Kihune (U.S. Navy, retired) to fly in from Hawaii for the ceremony. Second, the ceremony recognized all those Nisei who served in the military between the dates of Dec. 8, 1941, and Dec. 31, 1946, and so it included many Military Intelligence Service veterans who served in occupied Japan. The only other requirement was Placer County residency before and/or after the war. Third, the ceremony included words by MIS veteran James Iso, providing the perspective of one who was there. After his military service, Iso began a lengthy career in the U.S. Foreign Service before retiring to Placer County. The last aspect that made this ceremony unique was the awarding of Congressional Gold Medal replicas to two 442nd Regimental Combat Team soldiers who were KIA (killed in action). Masa Sakamoto was one of four Sakamoto brothers honored on this day. The other was Kay Kiyoshi Masaoka. To date, no relative of Masaoka has been located to accept the medal on his behalf. The ceremony began with the presentation of colors by Sacramento Nisei Post 8895. Following the war, despite all of their bravery and demonstrations of loyalty to their country, the returning Nisei veterans were denied membership in established VFW and American Legion Posts, so Nisei posts were formed all over the western states, and included interior locations such as Salt Lake City, Denver, and Chicago. As evidence that times have changed, California VFW Commander Billie Hovey and several other VFW representatives were in attendance. 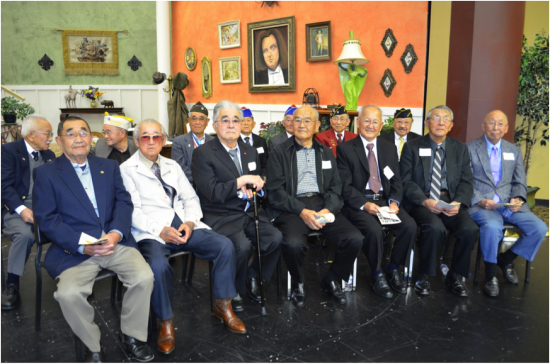 On stage were 14 living Nisei vets, some of whom had already received their gold medals in previous ceremonies, either in Washington D.C. or Sacramento, and some who would be receiving theirs on this day. After the awarding of the Bronze Stars, the ceremony was turned over to Vice Adm. Kihune for the keynote speech. The admiral had a bearing about him that made it easy to see why he had risen to three-star rank in the U.S. Navy. He spoke without notes to a hushed audience. His perspective was not just of a career military man, but as a young Sansei growing up in Hawaii and coming of age as the Nisei vets returned to the islands to re-establish their lives. Over eighty gold medals were presented on this day, either to living vets or to their family members. There were other eligible recipients, but no one was able to accept on their behalf. Michiko Uyeda of Loomis received the Bronze Star on behalf of her brother George, and five gold medals on behalf of her husband and four Mayeda brothers. A lot of work went into this ceremony, but seeing the looks on the faces of the veterans and their families made it all worthwhile. The ceremony was a joint effort of the Placer Buddhist Church, Loomis United Methodist Church, and the Placer JACL. David Unruhe is the governor of JACL’s Northern California-Western Nevada-Pacific District.